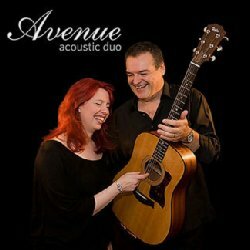 Avenue is a versatile, stylish and accomplished modern acoustic duo, performing familiar contemporary and classic songs. We re ideal for venues where a larger band is impractical because of space or noise restrictions. With just an acoustic guitar, an outstanding female vocalist and minimal amplification, we play 100% live with no backing tracks. Avenue help create a relaxed atmosphere by playing tasteful background music for caf s, restaurants, pubs and clubs, adding in livelier numbers when people want to sing along or dance. We provide afternoon or evening entertainment, and are equally at home in a cosy bar, a club or at a barbecue. We can also tailor a range of packages for weddings, corporate functions and private parties; please ask us for more information. Our core repertoire leans toward popular music and light jazz. It includes contemporary numbers from artists such as Lily Allen, Take That, Beyonc , Duffy, Amy Winehouse, Kaiser Chiefs, Michael Bubl , Snow Patrol and many more, along with classics and standards from the likes of Bryan Adams, Aretha Franklin, Dionne Warwick, Dusty Springfield, Whitney Houston and Eva Cassidy. We are self-contained, and use a very compact top-of-the-range 220W Fishman PA unit, giving hi-fi quality sound and a wide spread specially tailored for smaller venues. Our equipment is PAT tested and we have 10 million public liability insurance.